Army Secretary Peter Geren is expected to recommend that a retired three-star general be demoted for his role in providing misleading information about the death of Army Ranger Pat Tillman, military officials say, in what would be a stinging and rare rebuke. Army officials say seven officers will be punished, including the commanding officer who knew at Tillman's memorial service how the Army Ranger died, reports CBS News correspondent Kimberly Dozier. Lt. Gen. Philip Kensinger lied to the family, and later, to Army investigators about what he knew when. Kensinger, who headed Army special operations, is one of six high-ranking Army officers expected to get official reprimands for making critical errors in reporting the circumstances of Tillman's purported friendly-fire shooting in Afghanistan in April 2004. The officials requested anonymity because the punishments under consideration by Geren have not been made public. The Army said that no final decisions have been made, and that once they are and the Tillman family and Congress have been notified, there will be an announcement sometime next week. Geren also is considering issuing a letter of censure to Kensinger, who is receiving the harshest punishment of those involved in what has become a three-year controversy that triggered more than half a dozen investigations. Five other officers, including three generals, are expected to be issued less severe letters criticizing their actions. The secretary of defense is expected to rule on the Army's final recommendations next week, adds Dozier. Army officials opted not to impose harsher punishments, which could have included additional demotions, dishonorable discharges or even jail time. One senior officer, Lt. Gen. Stanley McChrystal, commander of the Joint Special Operations Command, escaped punishment. She rejected the Pentagon's characterization of the officers' offenses as "errors" in reporting Tillman's death, when several officers have said they had made conscious decisions not to tell Tillman's family that friendly fire was suspected. Geren's pending decisions come four months after two investigative reports found that Army officers provided misleading and inaccurate information about Tillman's death. A central issue in the case has been why the Army waited about five weeks after it suspected the former NFL star's death was caused by friendly fire before telling his family. The probes found that nine officers — including four generals — were at fault in providing the bad information and should be held accountable. But the reports determined that there was no criminal wrongdoing in the actual shooting, and that there was no deliberate cover-up. Geren then tapped Gen. William Wallace to review the probes and recommend disciplinary actions. Wallace disagreed with initial findings against McChrystal, according to the military officials. But Wallace also surprised Army officials by singling out a 10th officer for rebuke — one who had not been blamed in the earlier reports. Brig. Gen. Gina Farrisee, who is director of military personnel management at the Pentagon, is expected to receive a letter of punishment for her involvement in the oversight of the awarding of Tillman's Silver Star. Two others who were blamed in earlier reports are also expected to receive letters of admonishment: Brig. Gen. Gary Jones, who led one of the early Army investigations into the matter, and now-Brig. Gen. James C. Nixon, who was Tillman's regimental commander. Jones, now retired from the Army, was faulted for failing to address several issues in his probe, leading to speculation that Army officials were concealing information about Tillman's death. It is no surprise that Kensinger, 60, is targeted for the most severe punishment. An investigation by the Defense Department's inspector general found "compelling evidence that Kensinger learned of suspected fratricide well before the memorial service and provided misleading testimony" on that issue. That misrepresentation, the report said, could constitute a "false official statement," a violation of the Military Code of Justice. Farrisee's rebuke is tied to the Army recommendations that Tillman receive the Silver Star. The investigations found that Army officials were aware that Tillman was likely killed by friendly fire even as they were moving ahead with the medal that was awarded for heroism in the face of the enemy. If Geren does recommend to Defense Secretary Robert Gates that Kensinger lose a star and be demoted to major general, that would trigger a decrease in his retirement pension and benefits. The letters of rebuke for the others could also be crippling blows. They can include letters of concern, reprimand or censure, with escalating degrees of gravity. "For officers generally, a reprimand is a devastating career injury," said Eugene Fidell, a lawyer who specializes in military cases and teaches at American University's Washington College of Law. "It can trigger an effort to throw the person out of the military, it can trigger a reduction in pay grade when the time comes to retire, it can prevent a future promotion, and it can gum up a promotion that has already been decided." For a one-star general, Fidell said, it could mean they are likely to never get a second star. And, he said, a lower-level officer, such as a captain, "would have to dig out of a deep hole to continue his or her career. Letters of reprimand are truly bad news." 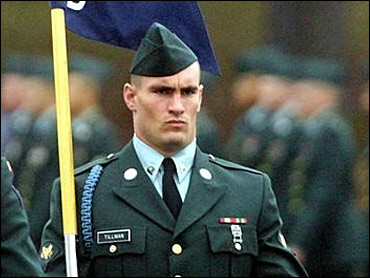 Earlier this week, congressional investigators said they intend to question several former White House officials about their knowledge of Pat Tillman's death, escalating an inquiry into what and when the Bush administration knew about the high-profile friendly fire case. The House Oversight Committee pressed for drafts of presidential speeches, saying the White House has previously turned over to lawmakers such drafts from the run-up to the Iraq war. The former White House officials would likely be allowed to choose whether to be deposed under oath or interviewed, committee officials said. The committee plans a second hearing on Tillman's death for Aug. 1, this time to probe what senior Pentagon officials knew and when. Former Defense Secretary Donald H. Rumsfeld; Richard Myers, the former chairman of the Joint Chiefs of Staff; and Abizaid were among those the committee invited Friday to appear. Spokesman Trey Bohn said the White House had received the letter and was reviewing it. The five former White House officials the committee plans to question are Dan Bartlett, the recently resigned White House counselor and communications czar; Scott McClellan, a former White House press secretary; Michael Gerson, a former speechwriter; John Currin, a former fact-checker on the speechwriting team; and Taylor Gross, another former spokesman. Tillman, a San Jose native, turned down a lucrative contract with the Arizona Cardinals to join the Army following the Sept. 11 attacks. He was killed April 22, 2004, in Afghanistan.